A soldier thought a military base was "under attack" after hearing gunshots on the night a trainee soldier was killed, an inquest heard. Epi Naiova was on guard duty at Deepcut Barracks in Surrey with Pte Geoff Gray, 17, on the night the teenager suffered two gunshot wounds to his head in September 2001. 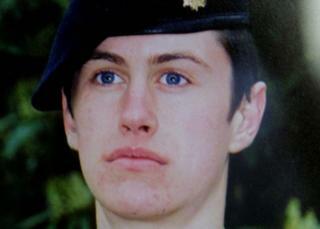 He gave evidence at a fresh inquest into Pte Gray's death. Cpl Naiova told Woking Coroner's Court they were on high alert after 9/11. He said: "I thought we were under attack since were were guarding the officers' mess and, since it's five days after 9/11, our security status was high. "I cocked my weapon. I was laying down on my belly buckle facing toward where the sound came from. "I was shocked and a bit panicking as well." He said 16 September 2001 was "a quiet night" on duty with Pte Gray and Pte Faye Mulraine before Pte Gray left for a "quick five-minute patrol around the perimeter" in the early hours of 17 September. Cpl Naiova said he was "surprised" and told Pte Gray he should be accompanied on a patrol but the teenager insisted he would be quick. Five minutes later Cpl Naiova heard what sounded like automatic shots being fired "from directly from where Geoff was heading". "Everyone was panicking and nothing was being found. I myself was panicking. It was a disturbing situation," he said. Counsel to the coroner, Bridget Dolan, asked him if he knew how Pte Gray, from Hackney, east London, came to be shot and if he fired his own weapon. Cpl Naiova replied "no" to both questions. John Cooper QC, for the Gray family, asked if it had occurred to Cpl Naiova that Pte Gray, originally from Seaham in County Durham, might have shot himself. He replied: "I assumed he must have tripped on the root of a tree." Mr Cooper asked: "Never once did you add to that the permutation that he might have shot himself?" Cpl Naiova replied: "That's true." Mr Cooper suggested Cpl Naiova was out of control and told him an earlier statement reported him as saying "I'm ready to kill". Cpl Naiova denied that was true. He further denied the suggestion he had gone on a search by himself and a claim that his weapon was warm. The new inquest was called after fresh evidence came to light. Four soldiers died from gunshot wounds between 1995 and 2002 at the barracks: Privates Sean Benton, 20, Cheryl James, 18, and James Collinson, 17.